At least 8 million people poured out onto the streets of Russian cities to commemorate the 70th anniversary of the victory over Nazi Germany, and hundreds of thousands marked the date in former Soviet republics and further abroad. The march of the Immortal Regiment – younger Russians marching on behalf of their ancestors who fought in the war, carrying their photographs. Born three years ago, the idea has become popular throughout the country, and this year Vladimir Putin was at the head of the Moscow procession, numbering hundreds of thousands. Hundreds of thousands lined the streets of Moscow, as armored vehicles, including the new Armata T-14 tank, made their way to Red Square for the parade. On a perfectly clear day – guaranteed by cloud spraying technology – the celebrating crowds were captured with the help of a drone. Over 40 warplanes rose above Moscow for the parade, coloring the skies above the Kremlin in the red, blue and white colors of the Russian flag, and performing their spectacular, award-winning, piloting routines. Cameras mounted in the cockpits provided stunning views of the Russian capital. In Severomorsk, located on Russia’s Arctic coast, a crowd gathered to watch a salute from the guns of Russia’s formidable Northern Fleet. The onlookers watched displays from the flagship battlecruiser Pyotr Velikiy, and the brand new Borei-class submarine Vladimir Monomakh. On what has become a highly contentious date in the Baltic states, veterans laid flowers at the foot of the Bronze Soldier memorial in the Estonian capital of Tallinn. The statue had been relocated in 2007 amid great controversy. In Kiev, citizens and politicians from across the political spectrum gathered at the specifically-chosen People’s Friendship arch. Unlike almost all the other celebrations, this one was conspicuous in its lack of Soviet flags and stars – as Communist symbols are now banned in Ukraine. In the self-proclaimed Donetsk People’s Republic, more than 30 armored vehicles passed through the central street of Donetsk. Prominent militant commanders, who have been involved in battles against government forces for the past year, manned the vehicles in dress uniform adorned with stars and DPR patches. A new anthem was presented during the celebrations. In Belarus, which suffered some of the greatest casualties during World War II, President Aleksandr Lukashenko and his 11-year-old son both attended the parade dressed in matching Field Marshall uniforms. Those members of the Russian motorcycle club, the Night Wolves, who had managed to get through European border control and re-trace the Red Army’s 1945 route to victory, finally arrived in Berlin. There they attended an Orthodox Church service, before riding through the streets of the German capital and laying flowers at the hulking Soviet war memorial in Treptower Park. 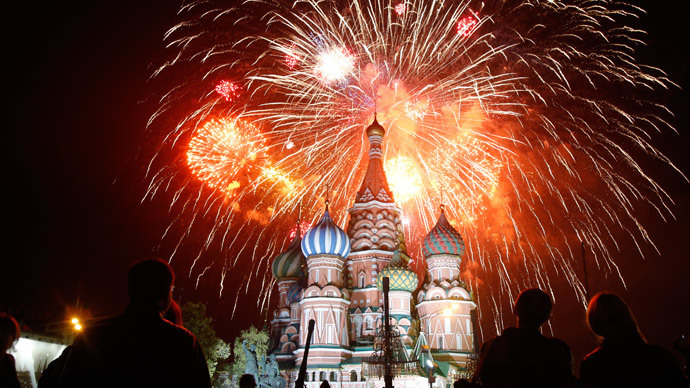 The evening ended with a traditional fireworks displays in 26 cities across Russia, with particularly powerful cannonades set off in cities where fighting was heaviest, such as Volgograd and Sevastopol. In both, Moscow and St.Peterburg, some of the guns that featured in the conflict over seventy years ago, were re-purposed to create the light show.